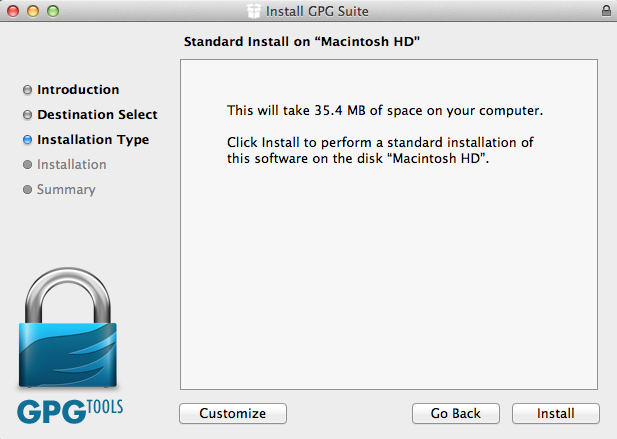 The GPG website suggests that GPGTools as an easy way to install GPG on a computer running Apple OS X. 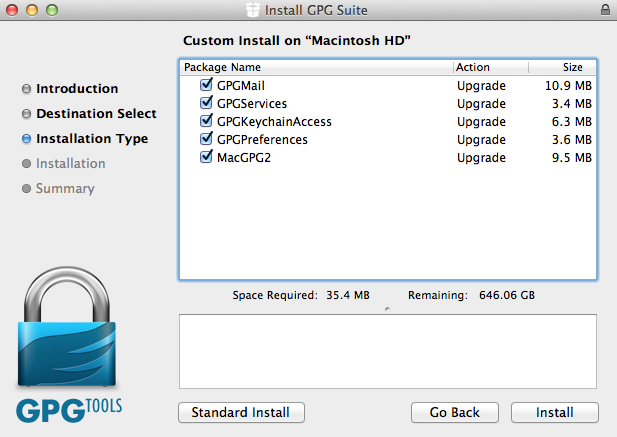 The GPGTools installer is easy to use, and will install the necessary components for encryption. By default it will install an add-on for Apple Mail called GPGMail, if you don’t use Apple Mail and don’t want this add-on installed you can de-select it during the installation process. Note: As of September 2018 (release 2018.4) GPG Mail is no longer a free plug-in for Apple Mail, and comes with a $25 fee for support for the current version. When you get to the screen below click on Customize. You will the see a window with options to de-select components of the installation. At the end of the installation process a web page will open with further instructions about using GPGTools. The website that opens is very good, but you don’t necessarily need to read it. A program called GPG Keychain Access will also open, and will ask you to create your first OpenPGP key (see section below first before creating your key pair). If you want to use Apple Mail for your encrypted email, you can create your first key pair using the GPG Keychain Access program that opened at the end of the GPG Tools installation process. If you want to use Thunderbird with Enigmail for your encrypted email, you should create your first key pair using Enigmail as this has more relevant options to Thunderbird.